Your luxury home away from home. Choice of a Queen room with Queen double bed with ensuite and sea and park views or a King room with King Double bed and ensuite. 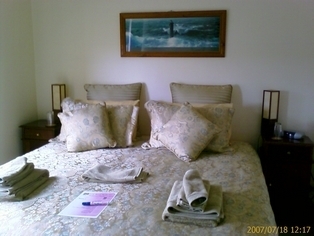 A Double room with King double bed or King twin beds with a separate private bathroom is also available. All rooms come with a Continental breakfast. A fully cooked a la carte breakfast is available for an extra $15 per person. We are licensed with spirits, beer, wine and softdrinks available. There is a TV in each bedroom, wireless internet available throughout the Bed and Breakfast. Lounge room has tea and coffee making facilities plus TV, DVD, Stereo and VCR. In house movies available. We are on walking trails to Jawbone National Park. Close to restaurants, shops and public transport. Take a ferry ride to the City, the Football or St Kilda. Close to Werribee Mansions, Werribee Zoo, National Equestrian Centre, Scienceworks, Railway Museum, Maritime Museum.